If you’re an enthusiast of the great outdoors, especially if you like to trek in solitary fashion, you need a knife that offers a maximum utility and is crafted from the best materials. That’s because when it comes to relying on your own resources and those provided by your environment, you need a tool that offers functional performance of the highest quality. It’s not about having fancy gadgets or even multi-tool appointments incorporated into a single unit, it’s about having a single tool that you can turn to a variety of purposes, one that won’t quit on you before your task is complete. 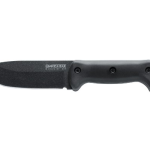 The Cold Steel Survival Rescue Knife (SRK) offers just this, without frills that might get in the way of your time or your task. 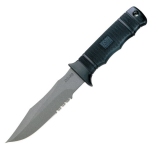 Both survival and rescue occupations require a knife designed to withstand constant use in a variety of applications. That knife must also be crafted to withstand the most extreme abuse, while remaining reliable, because it may be the only tool you have to ensure success and survival. The Cold Steel SRK is just such a knife. Manufactured from the highest quality AUS 8A stainless steel, the blade is then coated with a resilient layer of Teflon, which will prevent any damage to the metal. This knife is all about balance in every aspect. The 3/16 inch thickness with a perfectly apportioned point and edge ratio provides a maximum sturdiness without sacrificing the essential quality of sharpness. The clip point is designed to be ultimately sturdy without sacrificing an ability to fulfill tasks that require delicate precision. However, this is a blade with enough belly to render cutting, slashing or skinning strokes with ease. A single finger guard and a deeply checkered Kraton grip offer a streamlined knife profile that will allow you to complete each task with maximum efficiency, even in tight spaces. What matters more than any guarantees of performance provided by a company are reports of actual field experience with a tool. This knife receives high marks across the board for versatility and resilience. The 3/16 inch thickness provides a maximum of utility for a variety of purposes. While some may desire a blade that holds a razor-sharp edge for the purposes of very fine work, the Cold Steel SRK is designed to withstand a variety of tasks, both rough and fine. When viewed with this in mind, its performance in the field is exemplary. It is easily sharpened with a stone, but holds the edge for weeks of the hardest use. AUS 8A stainless steel holds an edge better than other blades fashioned from high carbon steel, but will take resharpening as often as needed for your purposes. The clip point bears up well under the most rigorous abuse, allowing you to use it for chipping and hacking as well as skinning, slicing, and cutting. This knife is suited to the full range of qualities of material you’ll encounter in the field—soft, hard, brittle, flexible. Whatever you encounter, the SRK is ready to help you power through it. 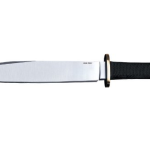 For the price, this knife cannot be compared to any competitor blades. 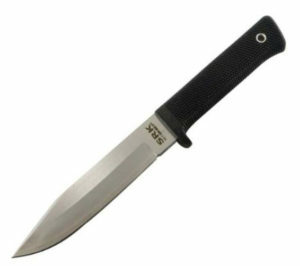 It outperforms every other knife in its range and many that are more expensive. The only slight complaint about this knife has nothing to do with the blade itself, but with the sheath. 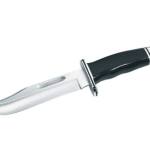 The knife does not firmly seat in the sheath and slides out with too much ease. This can be remedied in part by tightening a few of the screws to achieve a tighter fit, but it may never be as snug as you desire. However, in light of the knife’s excellent attributes, this issue is an extremely minor one that can also be remedied by purchasing a custom sheath for your new favorite knife. The Cold Steel SRK comes highly recommended and stands up to its reputation as an exemplary blade.